"The Times has exceptional influence in such fields as theater, music, art, dance, publishing, fashion and the restaurant industry. We are constantly scrutinized for the slightest whiff of favoritism. Therefore staff members working in those areas have a special duty to guard against conflicts of interest or the appearance of conflict." Do you think your coverage of Paley's Place in "The Pour" and in your published article met those standards? "Because our voice is loud and far-reaching, The Times recognizes an ethical responsibility to correct all its factual errors, large and small. The paper regrets every error, but it applauds the integrity of a writer who volunteers a correction of his or her own published story." As you now state that you shouldn't have participated in the wine event at Paley's Place, do you think the electronic version of the story should carry an addendum, and will you request one? 3. Were you aware that, before your arrival, the Paleys issued a press release inviting the public to dine with their "good friend" Eric Asimov? 4. In regard to that wine dinner: did you pay for your meal personally, through your expense account, or was it comped? 5. Have you ever been a guest of the Paleys at their home as well as their restaurant? 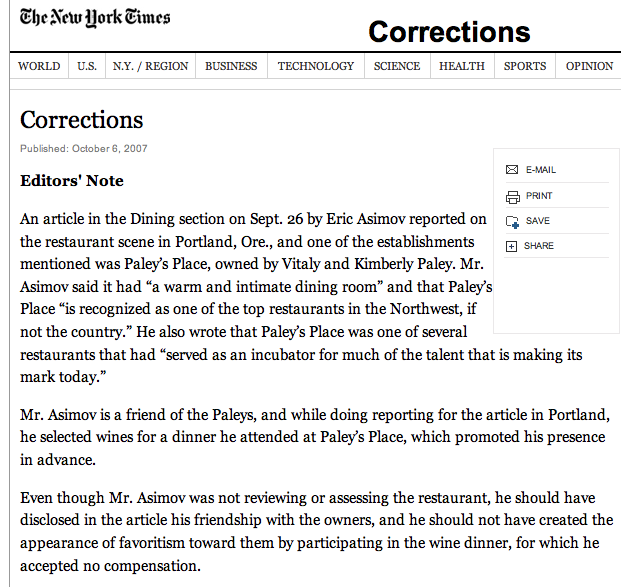 I've also got a similar letter out to Pete Wells, Mr. Asimov's editor at the Times. Willamette Week picked up the story this morning, so I don't think this is the end of it. On a similar note, Matt Elzweig of the New York Press has an eyebrow-raiser of a story this morning about Deborah Solomon, a columnist for the New York Times Sunday Magazine, and accusations from two of her subjects that Solomon plays fast and loose with her Q&As. The headline writer calls it "a pattern," which I think is far too strong a word when Elzweig cites only two examples...but those examples are doozies: Ira Glass of NPR's "This American Life," and syndicated columnist Amy Dickinson ("Ask Amy"). More evidence for a pattern comes from The Huffington Post's Rachel Sklar, who finds a third complainant against Solomon: Tim Russert, who detailed his grievances in a letter to the editor. Elzweig reports that Catherine Mathis, vice president of corporate communications for The New York Times Company, says that the paper stands behind Solomon. I'll be interested to see if they do the same with Eric Asimov. I want to reply briefly to your points. 1. The fact that Vitaly Paley's mother is my younger son's piano teacher is irrelevant to the story. 2. In retrospect, I probably should not have participated in the wine event at Paleys' Place. I'd like to discuss it with him in more depth...especially about his coverage vis-à-vis the Times' "Company Policy on Ethics in Journalism," but he's in France (and blogging about the difficulties with his cellphone), so we'll have to do it via email. When does a food/drink writer owe full disclosure? Costs were a major concern to Vitaly and Kimberly Paley, who arrived with an earlier wave of restaurant immigrants in 1994. Eager for a fresh start after working in some of Manhattan’s most illustrious restaurants, they toured the West Coast, finally settling on Portland. “We sold our 500-square-foot New York apartment, and with the money, we bought a house with a swimming pool, two cars, and had enough left to open a restaurant,” Mr. Paley said. Today, Paley’s Place, a warm and intimate dining room on the first floor of a Victorian house in northwest Portland, is recognized as one of the top restaurants in the Northwest, if not the country, and Mr. Paley has been celebrated for applying French techniques to the Northwestern palette of ingredients. Just as important, Paley’s Place, along with other seminal restaurants like Zefiro, Wildwood, Higgins and Genoa, has served as an incubator for much of the talent that is making its mark today. Few in Portland would likely dispute Asimov's characterization of Paley's Place. It shows up regularly on many best-of-Portland lists; the Oregonian named it "Restaurant of the Year" in 1999, and it's the highest-rated Portland eatery in the Zagat Survey of America's Top Restaurants. - Restaurateur Vitaly Paley's mother, Genya Paley, is an instructor at the Mannes College of Music, where she instructs Asimov's 15-year-old son Peter Asimov, an honors student at the school. As the younger Asimov's official biography states, "He has been a private piano pupil of Genya Paley since 2000." 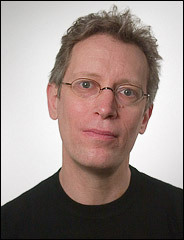 - When Eric Asimov was in Portland researching his article, the Paleys made him the centerpiece of one of their popular "Wine Wednesdays" dinners, sending out a press release titled "NEW YORK TIMES WINE CRITIC ERIC ASIMOV JOINS WINE WEDNESDAY AT PALEY'S PLACE" and inviting the public to meet "their good friend, Eric Asimov." ...I had another, better week, careering around the Northwest with my two teen-age sons, Jack and Peter. What a blast! We began in Portland, with a fabulous meal at Paley’s Place, which fits my definition of a restaurant gem — visionary yet soulful, with a fervent commitment to sustainable agriculture and local ingredients yet never preachy, and a great small wine list to boot. Seriously, how many restaurants do you know that claim to dry-age their own steaks? Paley’s Place actually does it, for 30 days, and you can taste the difference. And while the steaks take care of the bluff, hearty appetites, the menu offers complex, creative dishes as well, like scallops in sweet, creamed corn flavored with just a touch of orange and vanilla (and pork belly, of course). I’m salivating just thinking about the food. I have no doubt that Asimov enjoyed his meal. But it brings up a larger question about the slippery nature of food journalism in general. It's not uncommon for food and wine writers to be chummy with restaurateurs, sommeliers, chefs, farmers, etc. -- just as it's not uncommon for political reporters to socialize with politicos. But when a restaurateur describes a wine critic as a "good friend," and the critic then goes on to praise the restaurant twice in two months in the pages of the newspaper and online -- where should the line be drawn? 24. Relationships with sources require sound judgment and self-awareness to prevent the fact or appearance of partiality. Cultivating sources is an essential skill, often practiced most effectively in informal settings outside of normal business hours. Yet staff members, especially those assigned to beats, must be aware that personal relationships with news sources can erode into favoritism, in fact or appearance. Editors, who normally have a wide range of relationships, must be especially wary of showing partiality. Where friends and neighbors are also newsmakers, journalists must guard against giving them extra access or a more sympathetic ear. When practical, the best solution is to have someone else deal with them. 25. Though this topic defies firm rules, it is essential that we preserve professional detachment, free of any hint of bias. Staff members may see sources informally over a meal or drinks, but they must keep in mind the difference between legitimate business and personal friendship. A city editor who enjoys a weekly round of golf with a city council member, for example, risks creating an appearance of coziness. So does a television news producer who spends weekends in the company of people we cover. 68. No journalist may report for us about any travel service or product offered by a family member or close friend. I wondered: Does Asimov think his coverage of Paley's Place violates these rules, and did he provide full disclosure to his editor? Is the fact that he's the paper's wine critic, not its food critic, germane at all in this case? Am in France on assignment. Will repspond when I have a free few minutes in the next couple of days. I'll update this when I hear from him. In the meantime, I'm curious to hear your thoughts. Edited Oct. 6: This morning, the Times published an Editor's Note on the matter; you can read it here.